We believe that systems thinking and complexity science can be transformational in global health by increasing local capacity and shared learning, and minimizing unintended consequences. I will be participating in a Bellagio Conference on “Strengthening Health System Capacities through Institutional Development: Enhancing Collaboration between Donors and Institutions in Low- Income Countries” next August 27-31 at the Rockefeller’s Bellagio Center in Italy. The conference will be highly selective, and nearly all attendees have been chosen. However, we are interested in pre-conference collaborations. 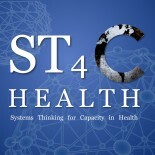 There is a growing consensus around the need for strong health systems to improve health long-term globally, and institutions play a crucial and central role in HSS by supporting and performing research, analyzing health policy, organizing social mobilization movements, and training health professionals. Our objective in organizing this conference at the Rockefeller Foundation’s Bellagio Center is to highlight the important role that institutions play in health systems, and outline concrete steps that donors can take to support the development of institutions in low income countries capable of adapting and responding effectively to ever-changing challenges. We will connect a unique mix of southern educators, researchers, and practitioners with on the ground institutional capacity building experience from the public sector as well as civil society, and link them with international donors that support innovative approaches. We aim to accomplish the following objectives: perform background research and develop relationships with donors and institutions before the conference starts; consider a web-based communication hub for future collaborations and learning; propose indicators for measuring the strength of institutions; draft a document of understanding between donors and institutions; publish our findings in a peer-reviewed academic journal; and propose an on-going, evolving mechanism to regularly evaluate the extent to which institutional capacity building programs are successful. We will be doing a substantial amount of pre-conference research and other preparatory activities. Let me know if you and/or your institutions are interested in collaborating. I work as communications adviser/researcher with the Health Policy Research Group in Nigeria and would be interested in participating in the conference next August. Hi I am a current ASPH program management fellow with a focus on HSS and I would be interested in joining the meeting. This entry was posted on September 19, 2011 by chads in Uncategorized.